Vol. 15, n°1 | 2012 : Médias sociaux et apprentissage des langues : (r)évolution ? In this paper, we examine the use of Facebook (FB) as a social networking tool in an intermediate French class. After reviewing the available studies on FB in language instruction, we analyze surveys that were administered to students as well as student FB posts. We look at the potential benefits of social media, specifically FB, and discuss its impact on foreign language learning. We aim to address how FB is being used in the language classroom, how students respond to the integration of this social networking site in courses, the attitudes of higher education foreign language learners towards FB, as well as the role of FB in new learning spaces and with today's learners. An analysis of survey data suggests that students respond in a positive manner toward the use of FB in education and highlights some differences in the way FB is used in both personal and academic settings. Dans cet article nous examinons l'usage de Facebook (FB) comme outil de réseautage social dans une classe de français de niveau intermédiaire. Nous passons en revue les études disponibles sur FB dans l'enseignement des langues, puis nous analysons des enquêtes faites auprès d'étudiants ainsi que des messages postés par des étudiants. Nous examinons les bénéfices potentiels des médias sociaux, en particulier de FB, et discutons son impact sur l'apprentissage d'une langue étrangère. Notre but est de voir comment FB est actuellement utilisé en classe de langue, comment les étudiants réagissent à l'intégration de ce site de réseautage social dans un cours, quelles sont les attitudes des apprenants de langue étrangère de l'enseignement supérieur envers FB, et également d'envisager le rôle de FB dans les nouveaux espaces d'apprentissage et avec les apprenants d'aujourd'hui. Une analyse des données des enquêtes suggère que les étudiants réagissent positivement à l'utilisation pédagogique de FB et met en valeur certaines différences entre la manière dont FB est utilisé en milieu personnel et en milieu académique. 1The impact of the Internet on language learning in the context of higher education has been growing exponentially. A number of years ago, early incarnations of the Internet provided students the opportunity to find information online and share their findings with other language learners. For today's generation, web 2.0 tools, namely "the writable web", (Karpati, 2009: 140) allow for the creation of new content; thus previously unexplored communication channels have been opened, providing language learners with new incentives and opportunities to easily interact with people from across the globe. In addition, Lomicka and Lord (2009) underscore the importance of the individual as part of the collective whole, which makes web 2.0 tools well suited for language learning in traditional and hybrid environments as it fosters both interaction and collaboration. Web 2.0 practices along with the growing use of the Internet have changed the nature of information flow and of how our students make sense of the world. These changes indicate that educators need new strategies and new tools to teach and capture learners' imaginations to fit their thought patterns and new socialization habits (Greenhow et al., 2009; Godwin-Jones, 2008; Winke & Goertler, 2008; Solomon & Schrum, 2007). With blogs, wikis, forums and social networking sites (SNSs), the new generation of students can express themselves in various ways that are electronically intertwined. During the last decade, the numbers of students and educators becoming active members of SNSs such as FB surged. As there are 28 million students between the ages of 18-25 using FB and over 500 million users worldwide (Facebook Press Room Statistics), it is not surprising that teachers are finding ways to use social networking in academia. Blattner and Fiori (2009) recognize that educators should acknowledge the importance of utilizing these types of web 2.0 tools in the context of higher education, especially since they meet the connectivity demands made by today's Digital Natives (Farris-Berg, 2005; Prensky, 2001; 2006). 2In educational terms, these social tools redefine learning in different ways. Firstly time constraints often limit the amount of face-to-face student socialization; however, SNSs offer new opportunities for students to connect easily with their classmates, peer learners and instructors on a new level that is more personal and motivating in many respects. As Mazer, Murphy and Simonds (2007) suggest, this type of interaction may have a positive effect on the student-student and student-teacher relationships, and may consequently lead to a more positive learning environment. Secondly, by using such emerging tools, learners have greater autonomy and are actively involved in knowledge development since they have more control over learning itself. Rather than exclusively delivering information from textbooks, new technologies heighten the engagement of students in finding, recognizing, and analyzing resources on their own. However, although SNSs such as FB are an integral part of the Net Generation students' life (Tapscott, 1997; 2009) and can be a viable resource in the context of education, learners do not necessarily know how to take advantage of web 2.0 tools in ways that would benefit them in computer-assisted language learning (CALL). Therefore, they need guidance in selecting the strategies to adopt in order to efficiently take advantage of this dynamic environment as well as to understand the implications of the public nature of web 2.0 tools. This paper examines the way in which students view the integration of a social networking community website in the classroom, since familiarity with technology does not necessarily imply that students possess the skills to use it in an educational context (Winke & Goertler, 2008). The results of pre and post questionnaires and a preliminary look at the posting in this social networking community revealed that students view the integration of FB as a positive element at different levels. It appears that today's language learners are receptive to using emerging tools and the use of SNSs has a place in the context of language learning, provided that the language educator is viewed as a facilitator of knowledge, guiding learners through the process of learning (Lantolf & Appel, 1994; Vygotsky, 1978). 3Computer mediated social networks have been growing at an exponential rate. Recently, Buffardi and Campbell (2008) pointed out that having a web presence and being in touch with a large number of individuals via SNSs has become part of the daily routine of people, many of whom are higher education students. In other words, according to Downes (2006), the emergence of web 2.0 is not simply a technological revolution, but rather a social transformation that enables and encourages communication as these websites allow members to express themselves and to interact with others (McBride, 2009). Multiple SNSs exist, but a particular one – FB – which was initially created by a Harvard student in 2004 for intra-campus socializing, now includes more than 500 million active members, one-third of whom are university students (Facebook Press Room Statistics). FB has become the most popular SNS among college students (Cassidy, 2006; Stutzman, 2006) and especially among young people in western countries (Godwin-Jones, 2010). 4FB offers a wide array of technological affordances1 supporting a diverse range of interests and practices which integrate several modes of Computer Mediated Communication (CMC) such as self-presentation, and one-to-one or one-to-many written exchanges. Solomon and Schrum (2007) claim that FB enhances existing stand-alone services in new ways. It allows its users to send e-mail messages, chat (text and video), participate in discussion forums, write on virtual message boards, which are also frequently used for performing various social tasks, such as wishing happy birthdays or making light-hearted remarks, and creating a profile which can include descriptive elements as well as pictures from a unique interface. Blattner and Fiori (2009) postulate that staying in touch with FB friends2 has taken on a new dimension, as it is facilitated by a series of notifications that users can receive informing them for instance of friends' status or profile changes, new wall postings3, new pictures, and so forth. It is therefore not surprising to see that this SNS has been described as: "a hip, hot and happening site" where members are able to witness life-in-progress with the possibility to view and share countless quantities of information (Vander Veer, 2008: 158). In addition, FB allows its users to engage in targeted performance by blocking certain viewers from seeing particular information. Therefore, users are able to tailor their privacy settings, which ultimately will impact their online presentations to various friends on FB, as they do offline. Another aspect that is unique to sites like FB is that they enable users to bond with individuals, an event which may otherwise not have taken place without this electronic tool (Schwartz, 2009). In fact, nowadays it is common for classmates to become friends on FB, as a way to share personal information with their peers as well as class information, including discussions of personal interests. Schwartz (2009) recently pointed out that for many students FB has become an extension of the classroom where all types of connections take place, some routine and some more substantial. In addition, like blogs, social networking sites provide users with opportunities and incentives for personal writing, self-reflection and interactive learning. For these various reasons, educators started to view FB as a resourceful tool in language pedagogy and higher education that, according to Godwin-Jones "has the potential to find means to link informal and recreational writing with academic writing" (Godwin-Jones, 2008: 7). 5In the context of second language acquisition, the sociocultural approach to language learning views students as active learners who become involved in their own learning process by engaging with others through authentic interaction (Lantolf & Thorne, 2006). Given the versatility of the FB site, it is likely that such an online public resource could positively impact the learning experience of many students and be a spring board for real-world activities that are not necessarily associated with the educational environment. 6During the last few years, Gross and Acquisti (2005) as well as Tufekci (2008) have investigated various aspects of SNSs and their users that relate to privacy issues focusing particularly on the appropriateness of making personal information public, as well as learning and teaching in general, and in the context of foreign language learning (Blattner & Fiori, 2009; 2011; McBride, 2009). In addition to issues related to privacy, an important body of research revolving around FB has focused on identity construction. The Internet has modified the traditional conditions of identity production, and privacy issues have become a general concern associated with the Internet and SNSs in particular. It has indeed become the norm for the Internet generation to reveal an enormous amount of personal information in cyberspace and this apparent openness to a vast network and acquaintances calls for increased attention (Gross & Acquisti, 2005). Students often do not know how to negotiate the boundaries between their public and private lives. Gross and Acquisti investigated the type of information that was made public on FB by university students. The results suggested that almost 40% of the participants listed their phone number on their profile, and more than 50% provided details about their current residence. In a more recent study focusing on disclosure behavior, Tufekci (2008) highlighted the fact that FB users remain oblivious to online privacy or the information they divulge. In a world where identity theft is a growing concern (Stutzman, 2006), the management and protection of identifying personal information is essential for academic institutions, although privacy threats usually result from voluntary disclosures (Tufekci, 2008). Digital Natives must also comprehend "audience management" (Tufekci, 2008: 21). Tufekci also explained that FB users must reflect on what type of information they want to reveal and to whom. 7Other studies focused on the social implications that SNSs bring to an educational setting. One recent experimental investigation (Mazer, Murphy & Simonds, 2007) examined the effects of teacher self-disclosure via FB on anticipated college student motivation, affective learning, and classroom climate. The results showed that participants who accessed the FB page of a teacher exhibited high levels of self-disclosure (i.e. showed personal pictures, revealed information about political views, hobbies, etc.) and anticipated higher levels of motivation and affective learning as well as a more positive classroom climate. In a similar vein, Rovai (2002) suggested that online environments such as SNSs provide learners with a new, stronger feeling of community belonging, which ultimately increases the willingness to share information, support each other, and encourage collaborative efforts. These findings are consistent with Kok (2008), who argued that it is important to provide learners with opportunities to develop a sense of group, but also to maintain the idea of a community as a unit that can interact, learn and work collaboratively. He further claimed that virtual communities may enhance the spirit, trust, interaction and the learning experience among students as a whole. 8There is relatively little research that discusses the pedagogical implications of integrating an SNS in the specific context of language classrooms; however, it is important to note that the few studies reviewed below unanimously point to positive influences that SNSs may have on the language learning processes. Blattner and Fiori (2009) drew attention to the potential of such a web resource to foster positive student relationships, to enhance the credibility of teachers engaged in contemporary student culture, and to provide constructive educational outcome and immediate, individualized opportunities to interact and collaborate with peers, instructors and native speakers of a variety of foreign languages (FL). They suggested that pedagogically meaningful integration of FB in the language classroom can develop a sense of community and can also impact the development of socio-pragmatic competence in language learners, which is an essential component of communicative competence. Furthermore, McBride (2009) argued that the typical daily engagement of students with FB could be a motivating factor to complete pedagogically useful foreign language experiences on the same website. Ultimately, if students develop communicative skills in a second language (L2) SNS and recognize the potential that this site offers in terms of connecting with other L2 speakers, they will increase their autonomy to practice various aspects of their linguistic ability. In her article, McBride described various ways to use SNSs to support language course objectives and also informed us of the possible difficulties in implementing the use of technological tools such as FB in FL classrooms. In another attempt at pointing out how educators can optimally use social spaces in language courses, Karpati (2009) argued that web 2.0 tools can, in general, facilitate educators in setting up collaborative learning as they place students at the center of the learning experience while at the same time allowing the teacher to function as the mentor and guide to knowledge construction and sharing. He also highlighted the fact that such tools provide authentic language education settings, which is an essential aspect in terms of achieving high communicative competence in a foreign language. 9In a more recent investigation, Stevenson and Liu (2010) explored the pedagogical and technical use of foreign language learning websites that use web 2.0 technologies (i.e. : Palabea, Livemocha, Babbel) in the context of foreign language learning. The results of this exploratory study provided insight into how the goals and designs of such web 2.0 tools fit with the goals and needs of current and potential language learners. The online survey results showed that the participants were interested in and excited about the possibilities of collaboration on social networking sites in terms of learning directly from other users including native speakers. However, the data also revealed that some sites were considered more user friendly and consequently more appreciated than others. 10Finally, Mills (2011) conducted a study focusing on the nature of student participation, knowledge acquisition, and relationship development within social networking communities. Students used the FB as a complement to the classroom environment and as an interactive tool where they could share collective reflection and access resources that enhanced the various topics discussed in class. She noticed that students not only made connections to course content, developed identities through the enhancement of interpersonal, presentational, and interpretative modes of communication, which are all typically used on FB, but also engaged in meaningful learning experiences and contextualized interactions within electronic francophone communities. The author pointed out that because this project primarily aimed at encouraging meaningful social interactions in lingua, error correction did not take place during the length of this project even though the public nature of the exchanges should have somewhat influenced the students' grammatical and orthographic accuracy. 11Overall, research advocates the positive and beneficial impact of using FB in the context of higher education. However, there is also a certain skepticism and apprehension especially by educators concerning the use of technology in general (Garrison & Kanuka, 2004; Lomicka & Williams, 2011) in their classroom. This reluctance to integrate technology applies particularly to the newer generation of social networking sites, as educators are unfamiliar with many of them and others are afraid to cross inappropriate social boundaries, which could merge parts of their professional and social worlds (Schwartz, 2009). Furthermore, investigations have yet to reveal information about students' attitudes regarding the integration of this resourceful website as a tool for sharing valuable learning experience in the context of foreign language classes, which is the focus of this study. How is FB being used in the language classroom? How do students respond to the integration of this social networking site in courses? What are the attitudes of higher education foreign language learners towards the social networking website FB? And what is its role in new learning spaces and with today's learners? These questions, among others, need to be addressed in order to facilitate the educators' task of developing pedagogically meaningful activities using SNSs in higher education classrooms and to contribute to the growing body of research on SNSs. 12It is important to understand how today's students use and make sense of FB, the SNS explored in this study. This understanding can provide important information for educators who also use virtual social networks to communicate with students and who are using or thinking about integrating such a tool in their classrooms as a teaching/learning resource to promote the development of a second language (for a report on pedagogically meaningful and effective tasks using FB see Blattner & Fiori, 2011). Firstly we seek to investigate how SNS are used in a language course and how students responded to this use. Secondly we examine attitudes of language learners as teachers have not been particularly receptive to using FB in academic settings. Many teachers may not see benefits to using FB and therefore students are not accustomed to its use in academic settings. Therefore we wanted to find out if students' attitudes evolved before and after having used it in a class. Considering what we currently know about FB and its uses in education, as well as the considerations of SNSs by previous work, the following research questions were devised to guide this study. 1) How do students react to using this social networking site in a language course? 2) What are the student perceptions of university level foreign language learners towards the social networking website FB within the context of a language course? 13The sections below consider the context in which FB was used and the methods employed to assess the data, from both a qualitative and a quantitative perspective. 14Twenty-four students between the ages of 18 and 21 (17 female, 7 male) were enrolled in an intermediate level French course at a southeastern university during the fall and spring semesters 2010-2011. One of the researchers was also the instructor of the class; the other researcher assisted with the project from a distance. The class, along with a partner class in France, used a group FB page created specifically for their course in which they participated in discussions that corresponded with themes presented in the course textbook. Since one of the course goals was to focus on honing communication skills, the use of FB forums was one way to assist students with that goal. Students also used Twitter, e-mail and Skype to promote different types of written and oral expression and communication. These out of class discussion opportunities related to in class material but extended discussion beyond the four walls of the classroom. Interaction took place among US students and with native French speakers enrolled in an English course in France. Due to the nature of the language exchange between the students in France and in the US, students used FB approximately twice a month both in their native language and in the target language. A thematic probe was posted by the course instructors and students were then given a week to respond to the questions and to interact. Student autonomy was also targeted in this exercise as it was set up to help students find, recognize, and analyze resources on their own. It also showed them how to develop their language skills autonomously outside of a classroom context. Students were awarded full credit if they responded with a post of at least 50 words; they were also given opportunities for limited extra credit by replying to others' posts. The goals of using FB were to develop linguistic competencies, to exchange perspectives on a given cultural topic, to build community among learners in the US and in France and to extend learning outside of classroom. For the purposes of this exploratory study, only data from students in the US were examined by one of the researchers and by a research assistant. The researcher and assistant constantly compared and calibrated their review of the data, to ensure that their assessments were similar as possible. 15In order to assess the status of our research questions, two different data sources were employed: surveys and discussion board posts. Each source is discussed in more depth below. 16Participants were administered surveys (see Appendices A and B) at the beginning (n=21/pre) and end of the year (n=23/post)4 in which they were using FB for their intermediate French course. The surveys asked the participants questions about their familiarity with FB prior to engaging in the project as well as at the end of their project, their reactions, and other general questions regarding the usefulness of the project in the specific context. The survey was designed by the researchers for this project. For each survey, the responses were tallied, numerically and/or qualitatively, to search for trends. 17Based on the pre-survey results, all but one student in the Intermediate French class (n=21/pre-survey) had a FB account prior to starting the course, which is consistent with participation numbers reported in earlier studies (Arrington, 2005; Gross & Acquisiti, 2005; Stutzman, 2006; Ellison, Heino & Gibbs, 2006) focusing on behavior and self-presentation in SNSs. Visiting FB has become a new routine for a large number of higher education students (Cassidy, 2006). In fact, results indicate that 95% of the students revealed that they typically spend two hours or less on FB daily and 90% of the students have had their FB account for four years or less. Post-survey results show that 65% of students used FB for two hours or less per day while 35% of students reported that they use FB for more than two hours per day. The data suggest, then, that almost all students were already familiar with and were regular users of this social networking tool. 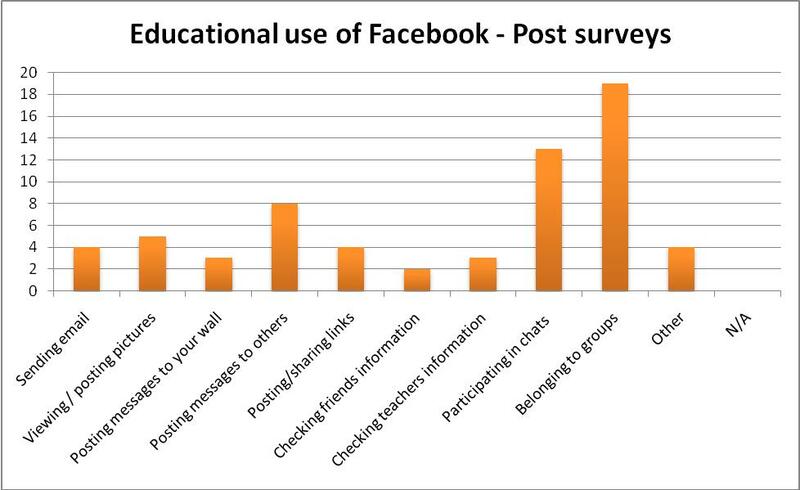 18Students were asked in both pre- and post-surveys about their uses of FB both personally and in education. The bar charts (Figures 1-4) draw attention to the results. 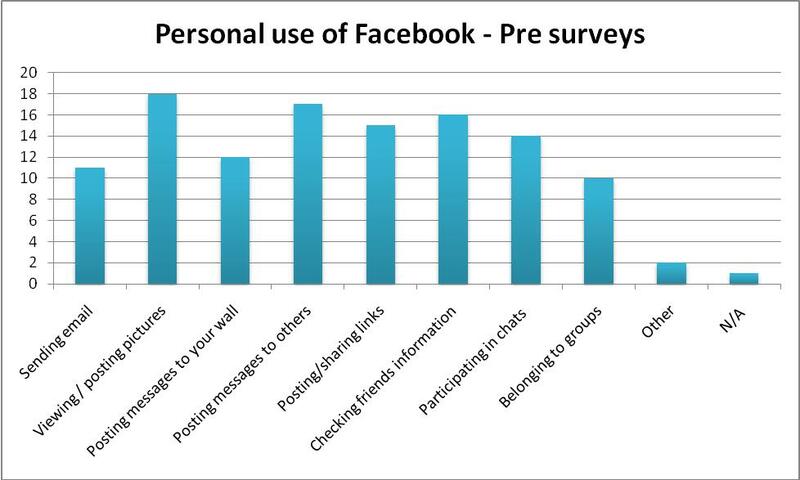 There are some striking differences in how students use FB personally as opposed to how they use it academically. For personal use, students primarily use functions such as viewing and posting video, posting to others' walls, checking friends' information and activities, sharing links and participating in chats. Educational uses, as reported by students, were quite different. For academic purposes, students commented that they participated primarily in groups and chats. Another interesting feature listed in the educational use of FB questionnaires is that students indicated that they rarely checked their friends or their teacher's information and activities. In other words, even though students had access to their classmates and professor's profiles during the semester, only 29% reported having looked at this information. Obtaining information about faculty is not a new concept in itself as earlier research investigations (i.e. : Nussbaum, Comadena & Holladay, 1987) revealed that even in the context of a traditional classroom, instructors typically self-disclose information about themselves through the sharing of personal stories as well as personal beliefs. In addition, Mazer, Murphy and Simonds (2007) established that accessing information about instructors had a constructive impact on the classroom climate, and ultimately upon the motivation of the students. While students had access to additional information, they did not always choose to consult or use it. Figure 1 – Personal use of Facebook: Pre Surveys. 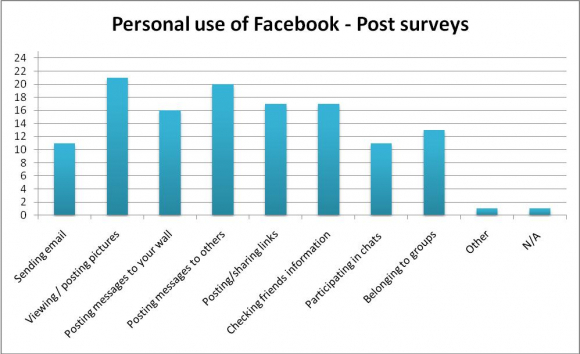 Figure 2 – Personal use of Facebook: Post surveys. Figure 3 – Educational use of Facebook: Pre surveys. 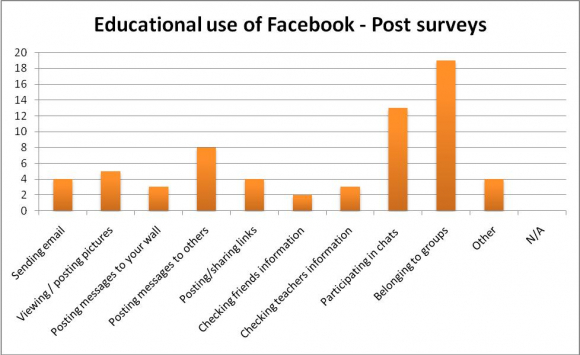 Figure 4 – Educational use of Facebook: Post surveys. 19When students were introduced to the idea of using FB as part of their language learning experience, they seemed initially to be surprised and said that they had not used FB in other learning experiences prior to the course. In fact, in the pre-survey, 90% of students surveyed indicated that they had no prior use of FB in a university course, which may explain why their educational perceptions of how FB could be used were rather limited. While using FB as part of their course, however, students were indeed interested in what their classmates were posting to FB – both pre- and post- surveys indicated that 62% of the students tended to log in daily to FB to check to see what others had posted to the discussion area. As to how students expected to use (pre) or used (post) FB with classmates in the US and in France, most indicated that they used the common discussion or the wall. So in other words, using FB in this context created a very social experience that facilitated both communication and language practice for the students. 20In the second part of the post-survey, students were polled about the features of FB that they found useful in learning and were asked to respond to a series of 10 questions by choosing one of five responses: strongly disagree (1), disagree (2), neutral (3), agree (4) or strongly agree (5). The results of this section were collapsed into disagree (1 & 2), neutral (3) and agree (4 & 5). Percentages of each response were calculated to make comparisons possible (see Table 1). Students responded that they appreciated the fact that they could discuss thoughts related to French culture on FB (83%) and that they enjoyed posting to a discussion forum (74%). Students also reported that they learned from their local classmates (65%) but learned even more from their classmates in France (91%). Students generally agreed that they felt comfortable posting their thoughts publicly (n=18) and that the project did not require too much of their time (74%); many found the project to be beneficial (70%). Students seemed more committed to continuing their public communication with local classmates (83%) after the course had ended and perhaps less so with peers in France (43%)5. It is also important to note that other learning management systems like Blackboard or WebCT, can typically only be accessed by students taking a specific class. A SNS such as FB allows students to be socially and academically connected with their classmates, instructor and native speakers as found in our study. Table 1 – Student Attitudes about using Facebook. 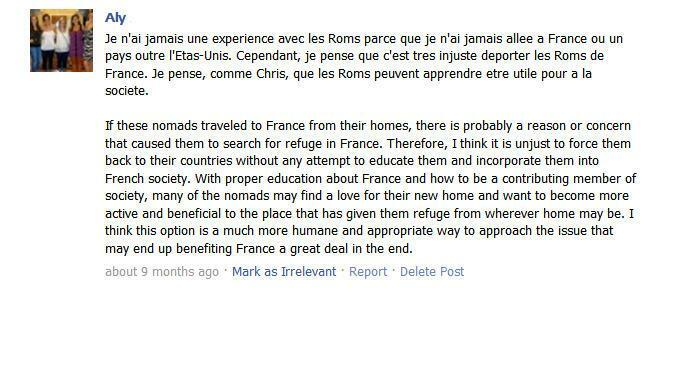 I appreciated being able to discuss my thoughts related to French culture on FB. I enjoyed posting to the discussion forum. I learned a lot from my local classmates. I learned a lot from the partners in France. I felt uncomfortable posting my thoughts publicly in the forum. The FB project took up too much time. Overall, the FB project was beneficial to me. I would like to use FB in other language classes. I will continue to use FB to communicate with French partners after the semester ends. 21Finally, the survey concluded with some open ended questions that addressed students' opinions of using FB, their interaction with classmates and students in France, other ideas for using FB, and if FB helped to build community with their peers. In reply to the first question, students generally reported that they liked the use of FB for a variety of reasons, which fell under two main themes: (a) facilitation of communication among students and faculty – collaborative exchanges and (b) language and cultural exchange. Some of the students' responses follow. In terms of communication, one student mentioned that "it was a good way to read other people's perspectives both here and abroad" while another stated, "[I liked] sharing my opinions and hearing from my other classmates". Finally, a student said that s/he "liked that it helped me get to know my classmates, there wasn't anything I didn't like". As far as using FB to learn language and culture, one student added that s/he "[liked the] extra chance to learn French/keep up with it outside of classroom" and another "liked learning about different aspects of French culture." A final student mentioned: "[I liked] practicing French casually outside of class". While the results were very positive, some students also brought up issues where they would like to see change. For example, one student did not like that s/he had to use his/her personal FB for school assignments, while another did not like FB in general and expressed his dissatisfaction having to create an account for this course. 22The second open ended question inquired about whether students read and interacted with classmates in the US and in France on the discussion forum. Since this activity was required and graded, students generally indicated that they read all of the posts and, in addition, often responded to others (a few indicated that they rarely responded to others). Some indicated that they responded to others in order to gain extra points. One student revealed that s/he "learned a lot" and another that s/he "gain[ed] perspective". Some students also brought up the point that they wished the French students had responded more often. 23In response to question 3, roughly half of the students indicated that they preferred to have more discussions and they would have liked to use FB chat. One student responded: "I don't believe something as personal as FB should be used too much for classroom activities" and another wanted a requirement to "add each other as friends". Since "friending" can be a delicate issue, students were not required to add each other as FB friends in a formal sense. Many students did friend each other by the end of the semester (average number of friends in the class and in France = 15) and it tended to happen more naturally with students in charge of the timing in which this took place as they grew to know each other better. Finally, students were asked how FB interaction has helped them to get to know and learn about their classmates. Many praised the idea and valued the opinion sharing that happened as part of the discussions ("I can see what they like to do. I am a visual learner so I can see what the culture is like as opposed to just talking about it"). Others indicated that it was a "great way to get info and communicate" as well as exchange perspectives and views. One student responded that s/he "learned about French perspective on topics like racism, terrorism, friendship, cinema, etc. ", the assigned topics for the discussion questions. Finally, a student raised the point that s/he was able to talk more on FB than class time would allow, which is an important pedagogical benefit that FB offers (see Schwartz, 2009). 24FB was used primarily as a place to exchange thoughts and perspectives on various thematic topics during the academic year. Figure 5 presents a visual picture of the Discussion Board used on FB. Figure 5 – Example of Discussion Board Topics. 25Students participated in nine discussion topics during the course of the academic year6. The total number of posts for each topic varied slightly but tended to range between 20 and 26; in addition there were at times up to 13 replies to others (see Table 2 for more details) on a particular topic. Although students were required to contribute (as part of their course grade), there were times when they did not complete their FB assignment. Variations in the number of posts also occurred due to the fact that the French partners contributed on a voluntary basis so their participation was not consistent nor was it always regular. Replies to others' posts were not required – students were given extra credit for doing so. Table 2 – FB Discussion Topics, Posts, Replies. 7 The number of posts and replies to others includes students in both the US and in France. 26Figure 6 shows a sample exchange from the Discussion area of FB. At the end of the survey, students indicated that their favorite topic was the Roms. The forum asked students to respond to the following prompt (prompts were sometimes given in French and other times in English). Please think about and respond to some/any of the questions below. There are several different names for the groups of people who travel. Do the names imply a difference in meaning? Are these groups prevalent in both France and in the US? For people who prefer to be "locataires" and move around, are they viewed differently than "sedentaires" Why/why not? The French government has recently deported many Roma (summer 2010) – what opinions do you hold about that? Have you had any encounters/ experiences with gypsies? Explain. 27Although the American students tended to respect the equal proportions required of French and English used, the French often did not. It happened on several occasions (as seen in Figure 6) that one student tended to respond either entirely in French or English. Students indicated that they enjoyed this topic because they had not had any previous experience discussing it and this particular assignment allowed them to also develop knowledge about topics that made national headlines abroad, conduct research on the Internet and expand their critical thinking. Figure 6 – Exchange from Discussion Area. 28Several students indicated that they felt they could benefit from corrective feedback on their posts. One student noted that the teacher should "grade FB posts for completion, but also include corrections on grammar and spelling! So that we can learn from our mistakes". Due to the fact that the students were communicating with native speakers, who would tend to ask questions if meaning was impaired, the instructor did not provide consistent corrective feedback. In Figure 7, we see a lack of grammatical accuracy displayed by an American student. There are minor problems with verb tenses, conjugations, adjective agreement and prepositions to name a few. However, none of these problems affect the overall comprehension of the idea. This particular project did not focus on corrective feedback or grammatical accuracy; however, a closer look and analysis of FB posts could be helpful to educators in understanding the production level of students and what grammatical points should be reviewed or emphasized. Teachers should encourage spontaneous language practice but also provide linguistic feedback to students. Depending on the nature and purpose of the task, this type of feedback could take place in FB. In future projects the instructor will attempt to provide occasional grammatical feedback on posts (as requested by students). Another means of feedback could be to provide grammar correction by way of native speaker partners. Figure 7 – Lack of grammatical accuracy. 29The general trend of the questionnaires suggests that students reacted positively to the use of FB in their intermediate French class. They identified a variety of beneficial aspects (social and pedagogical) linked to the integration of this SNS in their classrooms. For example, the students were graded on their contributions based on whether or not they were completed. It is interesting to note that students' posts are consistently meaningful as they have a real audience with whom they communicate. Students seem eager to respond to the discussion topics and interact with each other (reply posts to others ranged from 1-13 replies per topic). The social implication of writing in an electronic public sphere is known to impact the production of language learners in a positive and constructive way (Abraham & Williams, 2009). Further, each FB topic contained between 20 and 26 posts, not including replies, which also reveals a positive trend in use. Positive responses to technology such as this one are also identified in previous reports (among others: Blake, 2008; Farris-Berg, 2005; Luke, 2006). In one particular report entitled "Listening to Student Voices on Technology", Farris-Berg (2005) highlighted the fact that Digital Natives enjoy computer- and Internet- based resources in their classes and want to use technology to learn. As Gabriel, Wiebe and McDonald (2009) found in their investigation of the needs, interests and skills of new learners entering higher education, the conceptions of curriculum and pedagogy need to be more inclusive of the personal and social lives of students so that they can find more personal understandings, perspectives and motivations. Although the use of the Facebook forum may appear to be a more traditional learning tool for students in this study, it differed based on the fact that it brought the community of learners together. Traditional forum or discussion board tools lack this social element of learning that allows students to "see" when other students are online and initiate communication with them at a particular moment. Students could (but were not required) to use other social features of the site to interact with each other and create opportunities for additional learning and practice. 30In addition, the foreign language learners who participated in this study recognized that FB is a new platform where they can put their developing L2 skills to use and enjoyed doing so both with classmates and with native speakers in France. Students had to engage in authentic and meaningful exchanges, which are essential in order to develop communicative competence, and this cannot be achieved by exclusively focusing on learners' grammatical and lexical knowledge. In other words, the students discovered how FB can become a pedagogical tool in the context of foreign language classes and how they can exploit this resource outside of the classroom. We will now return to each research questions and discuss each in more detail. 31The first question looked at how students reacted to the use of this social networking site in a language course. Clearly FB is a SNS that is popular amongst students and one that they enjoy for personal use. While they have less experience with FB in academia, they responded positively to it in a language course. In terms of the ways students use FB personally and in academia, students tended to use FB in limited ways – for group discussions and videos. Group discussions on the forum were popular and used regularly. Personally, students take advantage of more functions offered by FB. While these results are not surprising, they do leave avenues for exploration and could perhaps encourage instructors to exploit some of the different functions of FB more fully in educational settings. The majority of students supported the use of FB in other language classes and felt that the FB project was beneficial to their learning, which points to a positive trend toward using this tool in educational settings. While the response to this SNS was overwhelmingly positive, students also provided a few suggestions for change, which will be discussed in the conclusion. 32The second question aimed to find out more about the perceptions of university level foreign language learners towards FB within the context of a language course. Students appreciated being able to talk about French culture on FB but they enjoyed even more having native speaker partners from whom they could learn. They also enjoyed being able to share their opinions while gaining a better understanding of the perspective of the French students. The atmosphere of FB, referred to by one student as "casual" and another as "pressure-free" was attractive to students in that it seemed to make them comfortable practicing their written skills outside of the classroom with peers. Overall, their experiences were very positive, and as one student put it: "I liked everything about using FB". We must take care, however, in pointing out that the positive response may be due to the "novelty effect", where improvements or positive reactions may occur when new technology is used. The positive results are not necessarily due to improvement in learning, but occur as a result of increased interest in the technology. 33In sum, this article reported on the use of FB in an intermediate level French class. It is important to note that this project was an experiment for both the instructor and the students and although results appear to be positive, we remain cautiously optimistic and encourage further investigations to substantiate these claims. 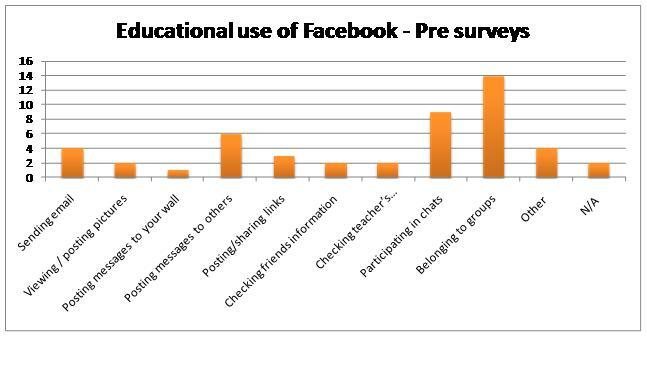 Despite growing up in the digital age and being familiar with technologies in general and especially SNSs, most of the students had never used FB for educational purposes, as the results of the survey confirmed in this study. Further, the results of this project coincide with those found by van Olphen (2007) and Auyeung's (2004) in that students view participation positively in online collaborative experiences. In the pedagogical realm, FB should be implemented in ways that promote communication, collaboration, and student-centered activities that will facilitate student learning and encourage high academic achievement. As Solomon and Schrum (2007) suggest, the Net Generation is already using a variety of web 2.0 tools for enjoyment; therefore it is up to educators to help them apply websites such as FB toward more serious endeavors. Such a tool clearly allows students to easily collaborate on projects; these virtual exchanges enhance the communicative engagement of language learners, and increase their confidence as well as their enthusiasm for the subject matter (Mills, 2011; Swaffar, 1998). While data from only one group was analyzed for this study, we would encourage future students to analyze data from all groups involved in order to present a more complete picture of the use of Facebook or other SNS in language classes. 34This study also points to several practical applications for the classroom. Firstly, SNS should be integrated as an extension of the classroom so that language development can continue in a fun environment when students are working from other places. Secondly, educators should find creative and interesting ways to use SNS with students. In addition to forums, which tend to be more traditional learning tools, SNS offer the option of group discussion on a Wall, one-to-one text and video chat, as well as visiting native speaker groups. Research on Facebook groups based on themes (i.e. regions, personalities…) covered in the textbook (Blattner & Fiori, 2011) can encourage students to gain a better sociolinguistic perspective on language by analyzing norms and actual language use among group members. Thirdly, care should be taken to discuss "friending" with classmates, whether local or distant. As Donath (2007) mentions, with the growth and expansion of SNS, traditional concepts of friendship and acquaintances emerge and should be discussed in the context of these new and social virtual environments. All of these options can help to provide students with extra L2 practice of interpretative and interpersonal communication skills such as reading, writing, speaking and listening. 35As educators, we can play a key role for these types of recent FB users, by guiding them on how to become familiar with key aspects of this popular SNS. In addition, by using an SNS in the context of a classroom, allowing classmates and the instructor to access personal sites, students are forced to (re)evaluate the type of information they disclose on their usually highly detailed profile. According to Windham (2005), students look for practical applications of their studies and therefore, should respond positively to the fact that faculty can provide them with strategies to remain safe, and to balance the benefits of using FB with the risk of losing control of private information. One issue raised by a student was privacy of information issues related to FB posts. FB offers various privacy settings and the teacher could show students how to change the settings in FB; one can choose which friends can see Wall postings or have access to various types of information on a person's page. An easy way to accomplish this would be to separate the class into a group (ex. French 1-A) and then assign privacy settings to this particular group. Educators can also help students to realize the importance of the public nature of FB and walk students through privacy settings available so that they can monitor which "friends" can access certain information such as pictures, videos, wall postings, tagging, checking in, and so on (for more information, see O'Neill, 2011). According to Windham (2005), students look for practical applications of their studies and should therefore respond positively to the fact that faculty can provide them with strategies to remain safe, and to balance the benefits of using FB with the risk of losing control of private information. 36Ultimately the goal of using a SNS is to provide attractive social interactions as well as a new way to find cultural information that stimulates language learners to further explore a target culture on their own, thereby becoming active partners in discussion and exchange. Blattner and Fiori (2009) point out that it is imperative that second language (L2) classes capitalize on the social and academic opportunities that high-tech learning has to offer. If students are already consistent and comfortable users of SNSs, they may eagerly embrace them in the classroom. McBride (2009) underscores that the type of interaction (reading and writing) that typically takes place in electronic media is different in a non-electronic setting. Consequently SNS-based activities in foreign language classes are fundamentally different from the pedagogical goals that educators aim for in a traditional environment. Unfortunately, e-learning tools have yet to be viewed as a mainstream component of foreign language teaching and have yet to become a foundation element used in L2 classes. The use of FB may be valuable as well for blended and online classes, as Youngs (2007) pointed out that e-learning students complained of not having contacts with other students, which negatively affected course performance. Given that research based on the integration of web 2.0 in a language learning environment is in its infancy, this study serves as an initial step towards developing a better understanding of the role that web 2.0 tools, and more specifically FB, may play in foreign language education. Even though the SNS FB appears to provide valuable benefits and opportunities for learners and educators in the field of foreign language education, more research is needed to further establish the effectiveness of web 2.0 tools in foreign language classrooms. Abraham, L. B. & Williams, L. (dir.). (2009). Electronic Discourse in Language Learning and Language Teaching. Amsterdam: Benjamins. Auyeung, L. H. (2004). "Building a collaborative online learning community: A case study in Hong Kong". Journal of Educational Computing Research, vol. 31, n° 2. pp. 119-136. Blake, R. J. (2008). Brave new digital classroom: Technology and foreign language learning. Washington DC: Georgetown University Press. Blattner, G. & Fiori, M. (2011). "Virtual social network communities: an investigation of language learners' development of socio-pragmatic awareness and multiliteracy skills". CALICO Journal, vol. 29, n° 1. pp. 24-43. Gabriel, M. A., Wiebe, S. & MacDonald, R. J. (2009). "Net generation expectations for technology-mediated learning at the university level". Research, Reflections and Innovations in Integrating ICT in Education, vol. 1. pp. 996-1000. Garrison, R. & Kanuka, H. (2004). "Blended learning: Uncovering its transformative potential in higher education". Internet and Higher Education, vol. 7. pp. 95-105. Greenhow, C., Robelia, B. & Hughes, J. E. (2009). "Learning, teaching, and scholarship in a digital age: Web 2.0 and classroom research: What path should we take now?". Educational Research, vol. 38, n° 4. pp. 246-259. Karpati, A. (2009). "Web 2 technologies for net native language learners: a 'social CALL'". ReCALL, vol. 21, n° 2. pp. 139-156. Kok, A. (2008). "Metamorphosis of the mind of online communities via e-learning". Instructional Technology and Distance Learning, vol. 5, n° 10. pp. 25-32. Lantolf, J. P. & Appel, G. (1994). Vygotskian appraoches to second language research. Norwood, NJ: Ablex. Lantolf, J. & Thorne, S. L. (2006). Sociocultural Theory and the Genesis of Second Language Development. Oxford: Oxford University Press. Lomicka, L. & Lord, G. (2009). The Next generation: Social networking and online collaboration in foreign language learning. San Marcos, TX: Computer–Assisted Language Instruction Consortium (CALICO). Lomicka, L. & Williams, L. (2011). "The Use of New Technologies in the French Curriculum: A National Survey". The French Review, vol. 84, n° 4. pp. 764-781. Mazer, J. P., Murphy, R. E. & Simonds, C. J. (2007). "I'll see you on 'Facebook': The effect of computer-mediated teacher self-disclosure on student motivation, affective learning and classroom climate". Communication Education, vol. 56, n° 1. pp. 1-17. McBride, K. (2009). "Social-networking sites in foreign language classes: Opportunities for re-creation". In Lomicka, L. &. Lord, G. (dir.). The next generation: Social networking and online collaboration in foreign language learning. CALICO Monograph Series, vol. 8. San Marcos, TX: CALICO. pp. 35-58. Mills, N. (2011). "Situated learning through social networking communities: The development of joint enterprise, mutual engagement, and a shared repertoire". CALICO, vol. 28, n° 2. pp. 345-368. Nussbaum, J. F., Comadena, M. E & Holladay, S. J. (1987). "Classroom verbal behaviors of highly effective teachers". Journal of Thought, vol. 22. pp. 73-80. Rovai, A. P. (2002). "Sense of community, perceived cognitive learning, and persistence in asynchronous learning networks". Internet and Higher Education, vol. 5. pp. 319-332. Solomon, G. & Schrum, L. (2007). Web 2.0 new tools, new schools. Washington: International Society for Technology in Education. Stevenson, M. P. & Liu, M. (2010). "Learning a language with Web 2.0: Exploring the use of social networking features of foreign language learning websites". CALICO Journal, vol. 27, n° 1. pp. 233-259. Swaffar, J. (1998). "Networking language learning: introduction". In Swaffar, J., Romano, S., Markley, P. &. Arens, K. (dir.). Language learning online: Theory and practice in the ESL and L2 computer classroom. Austin, TX: Labyrinth Publications. pp. 1-16. Tapscott, D. (1997). Growing up digital: The rise of the net generation. New York: McGrawHill. Tapscott, D. (2009). Growing up digital: How the net generation is changing your world. New York: McGrawHill. Tufekci, Z. (2008). "Can you see me now? Audience and disclosure regulation in online social network sites". Bulletin of Science Technology & Society, vol. 28, n° 1. pp. 20-36. Vander Veer, E. A. (2008). Facebook the missing manual. Pogue Press O'Reilly. van Olphen, M. (2007). "Perspectives of foreign language pre-service teachers on the use of a web-based instructional environment in a methods course". CALICO Journal, vol. 25, n° 1. pp. 91-109. Vie, S. (2007). Engaging others in online social networking sites: Rhetorical practices in MySpace and Facebook. Unpublished doctoral dissertation, University of Arizona, Tucson, AZ. Windham, C. (2005). "Father Google & mother IM: Confessions of a Net Gen learner". Educause Review, vol. 40, n° 5. pp. 42-59. Winke, P. & Goertler, S. (2008). "Did we forget someone? Students' computer access and literacy for CALL". CALICO Journal, vol. 25, n° 3. pp. 482-509. Youngs, B. L. (2007). "Teaching teachers: Methodological questions for the online environment." In Kassen, M. A., Lavine, R. Z., Murphy-Judy, K. & Peters, M. (dir.). Preparing and developing technology-proficient L2 teachers. CALICO Monograph Series Volume 6, San Marcos, TX: CALICO. pp. 67-90. Please answer the following questions about yourself and your experiences with Facebook in your French class. 7. Do you consider yourself as? 8. Prior to this project, did you have a facebook account? a. With what frequency do you facebook? b. For what purposes (i.e., personal, class, etc.) did you facebook? 9. How long have you had your FB account? 10. How much time do you spend on FB each day? 13. Approximately how often do you check Facebook to see what others have posted? 14. Are you "friends" on FB with other students in this class or from France? 17. Have you used FB in other classes at this university?  If so, for what classes and in what ways? 8. How often do you log on to your FB account each day? 11. Approximately how often do you check Facebook to see what others have posted? 12. Are you "friends" on FB with other students in this class or from France? 15. Have you used FB in other classes at this university? If so, for what classes and in what ways? Please answer Questions #16-#25 using a scale of 1-5, where 1=strongly disagree, 2=disagree, 3=neutral, 4=agree, 5=totally agree. 16. I appreciated being able to discuss my thoughts related to French culture on FB. 17. I enjoyed posting to the discussion forum. 18. I learned a lot from my local classmates. 19. I learned a lot from the partners in France. 20. I felt uncomfortable posting my thoughts publicly in the forum. 21. The FB project took up too much time. 22. Overall, the FB project was beneficial to me. 23. I would like to use FB in other language classes. 24. I will continue to use FB to communicate with French partners after the semester ends. 25. I will continue to use FB to communicate with classmates after the semester ends. 26. What did you like most / least about the FB Discussion boards in FR210? 27. Do you read / interact with other students from your university on the discussion board? Please explain. 28. Are there other ways in which you would like to use FB in French class? 29. Specifically, how has FB helped you to get to know / learn about your classmates? 1 This term is commonly used to describe the rich environment that web 2.0 tools offer to their users. In other words, it refers to the diverse applications available on this type of Internet based tools. 2 A FB friend is any FB member who has agreed that you know each other and usually have something in common. Two people become FB friends when one person extends an invitation and the other person accepts (Vander Veer, 2008). 3 One of the sections on every FB member's profile is a forum called the wall. It is a place for your FB friends to share interesting photos, videos, web sites or messages (Vander Veer, 2008). 4 From the 24 students enrolled in the class, only 21 completed the pre-survey (due to absences) and 23 completed the post-survey (due to absences). Only students in the US completed the surveys. 5 It is important to note that participation by the French students, although recommended, did not figure into their grade. Therefore, participation at certain moments was problematic. 6 Three additional topics were not included in the table: these topics were not included in the table because they represented either a way to practice the tool [2 introduction discussions] or a way to keep family and friends posted on the trip to France [voyage]. Geraldine Blattner is assistant professor of French and linguistics at Florida Atlantic University. She is the director of the French basic language program and the coordinator of the French, German, Italian and linguistics teaching assistants. Her research focuses on technology-enhanced foreign language teaching and learning and sociolinguistic and pragmatic variation in French-language computer-mediated discourse. Address: FAU, department of languages, linguistics and comparative literature. CU building. 777 Glades Road, Boca Raton, FL 33431, USA. Both authors contributed equally to this paper. Lara Lomicka is associate professor of French at the University of South Carolina, where she is the director of basic courses for French and the assistant director of teacher education. Her research interests include teacher education, intercultural and telecollaborative learning, and technology in language teaching and learning. She was recently honored as a Chevalier dans l'ordre des palmes académiques. Affiliation: University of South Carolina. Address: 809 Humanities, Department of languages, University of South Carolina. Columbia, SC 29208, USA.